My previous post was all about books. I said we carry few items other than books. Today, however, we got in a new line of journals from the good people at Field Notes. They have a variety of lined, blank and ruled journals. They also have a new line of 'County Fair' editions for each and every state. Currently we only carry the MN edition. Each notebook has state facts and trivia and comes in a pack of three for $10. 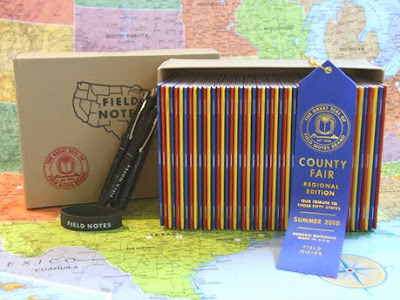 From these little notebooks I've learned that MN has 87 counties. Tenney is the smallest town with a population of six. Eagle Mtn. is our highest point at 2,301 feet. The three-packs come in a sharp combo of blue, red and yellow.